It's kind of rare that my philosophy research is immediately relevant to a hot policy issue, but that seems to have happened! And it's important that I say a little more about that, just so that people don't come here via Ezra Klein's link and then say, "wait, this guy just blogs about pervy uses for purity rings." One of the papers I've been presenting on my trip around the world is about what goes on when people act irrationally. The kind of irrationality I focus on is the kind where we have vivid images of things connected to the satisfaction of one desire in our environment, but not the other. These vivid images make one of our passions more violent, as Hume would say, causing it to overpower the other passion in determing our behavior. This is the kind of irrationality involved when I stay up too late watching dumb YouTubes and am less productive the next day. Or when somebody eats food that they know is unhealthy because it's right there and it looks so delicious. If I could have some sort of engrossing vision of the rewards of the next day's productive work, or if the eater could have a vision of the consequences of healthy eating, the other passions would become more violent and we'd act differently. But often there isn't anything to make people vividly imagine the objects of their other passions, and they chase the thing that's most vivid in their mind at the moment. There still can be a sense in which they want the other thing more, however. And this is the sense in which we talk about people's desires while they're asleep (as Matt noted). You can say that the sleeping person "wants to lose weight, find a better job, and pay down his student loans" even though he obviously isn't about to act on any of those. He's sleeping. But he still has the mental dispositions that make these claims true. I think it's this dispositional sense of desire that's important in saying what it's rational for people to do. It's rational to do whatever looks like it'll maximize dispositional desire satisfaction. And if the desires for getting work done and being healthy are stronger dispositionally than the desires for YouTube videos and unhealthy food, we can still say it's rational to go to bed on time instead of watching the videos, or eat healthy. So that's the paper. (There's also a part at the beginning where I talk about people who want to do impossible bad things like murdering the dead, but let's set that aside.) 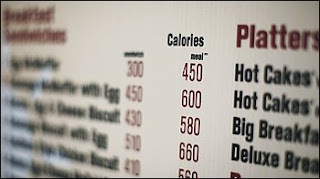 But now for the tie-in to the issue of requiring restaurants to say how many calories each dish has. This is the context in which the issue came up in Matt and Ezra's posts. In his new awesome Washington Post column, Ezra mentions research saying that "we wildly underestimate the calorie content of meals we order in restaurants. Worse, as meals get larger, we underestimate the calorie content by even more." One of the benefits of menu labeling -- which has been mandated for chain restaurants in NYC -- is that it'll replace our false judgments with true judgments on this issue and guide us to smarter choices. I'd suggest another benefit, which I'm sure is smaller but perhaps still considerable. Not only will seeing that little number correct your false beliefs, but if you already have a dispositional desire to be healthy, it'll give you a little image to jog your desire into action. Certainly it won't be as vivid an image as a sudden vivid hallucination in which you see your morbidly obese future self, or somebody having a stroke at age 55. But especially if your desire for good health isn't usually at the forefront of your mind, it'll cue you to mind your health, at a time when you might've had nothing else to cue this desire before. That might very well lead to more rational eating. Are you circulating the paper? You know, I should... I'm working out some final revisions before I send it off, but I'll have it up in a week or two. Have you read Predictably Irrational by Dan Ariely? It comes at the irrationality problem from a psychological perspective. Ben and I thought it was pretty interesting. I agree with your point about human psychology, but Korsgaard's argument seems fairly powerful to me. Why privilege non-activated dispositional desires? And in what sense are they dispositional, if they do not influence how you act at the time? I'd like to see the details of your response. Thanks, Hope... I really should delve more into the psychology literature on this. I've gotten into the neuroscience a little. Ben, I'll let you know when the paper is up. The basic outline of my response is that the default methodology for building theories of practical rationality is some kind of intuition-based reflective equilibrium thing. And in cases where we act on our immediate desires, but fail to maximize dispositional desire satisfaction, the things we do are intuitively regarded as irrational. I'm just trying to fit our intuitions here, and building norms of rationality off of dispositional desires is the way to do that. The classic psychology paper on this sort of thing is probably Loewenstein (1996), "Out of control: Visceral influences on behavior," in Organizational Behavior and Human Decision Processes, which you can find online through Google Scholar. His focus is on how drive states like hunger can exert such a powerful influence on behavior and crowd out other motivations. Another interesting place to jump into the psychological research is a recent book chapter by Bargh & Huang (2009), "The Selfish Goal," in The Psychology of Goals (Moskowitz & Grant, Eds. ), which you can read online through Google Books. They review a lot of the recent work on conscious and nonconscious goals, and argue that we could see the currently activated goal as operating autonomously to control behavior, without any role for the conscious self. I don't mean to sound castigating, but I'm surprised that you would even broach the topic without having delved much deeper into psychology and (the overly derided) psychoanalysis. Again uncastigatingly, I think it is irresponsible philosophy. But god, I love neutral mill hotel. One of the best albums ever in my opinion. Back in my fourth year of grad school, I spent a fair amount of time sifting through the psychological literature on desire. It wasn't especially profitable. Sure, there were a bunch of nifty experiments that showed a bunch of nifty things, but there wasn't any consensus on what systematic model of the mind to integrate these results into. I suppose I could pick the model most favorable to my views and present it as fact, but that just didn't seem respectable. The neuroscience literature was slightly more promising, as it at least was driven by the need for more systematic models of motivation. But I remember reading Tim Schroeder's Three Faces of Desire and then Leonard Katz's review and then thinking, uh-oh, I'll have to give these guys a couple more years to figure stuff out before I can be confident in what they're saying about pleasure being located here or there in the brain, and connected to desire in this or that way. Another thing that made looking into the psychological research unproductive is that a lot of my baseline assumptions about the functional outputs of desire were also unstated assumptions of the experimenters. (For example, the idea that desire is capable of motivating action or that it directs one's attention towards desired objects.) Which sounds like it'd be nice, but it prevents you from having empirical proof of the claims about desire that you want. I should probably get back into that stuff. But really, my first experience with trying to integrate the psychology literature into philosophy was pretty disappointing.